02/19/19 — Sets Admirable Crichton, Bedazzled, Talk Radio and Will Success Spoil Rock Hunter? MVD Entertainment Group announced this past week that documentary filmmaker Alexander Monelli’s At the Drive-In will be making its way to the DVD marketplace on Apr. 9. They were the rage in the 1950s and ‘60s, the neighborhood drive-in theatre. Kids of the Baby Boom could be packed in the family automobile and make a family night at the movies, complete with hot dogs, pop corn and anything else that could be stowed in the car (include teens in the trunk). But as the suburbs blossomed, so did property values and the need for strip mauls, apartments and homes. The property value of an eight, ten or more acre parcel became more valuable than the business of showing movies … and one by one by they closed. 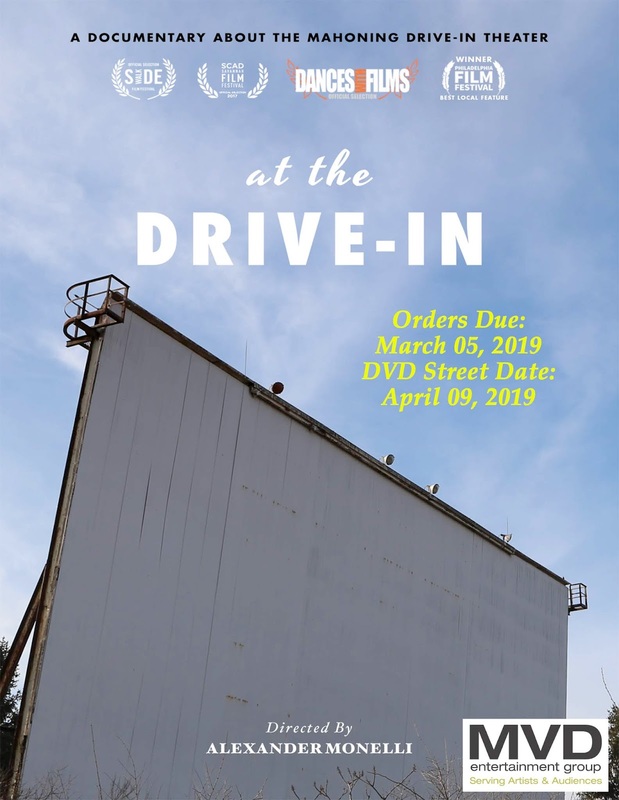 Filmmaker Alexander Monelli originally had in mind a film about drive-in theatres in general, but as he worked on the project he came across the die-hards of Lehighton, Pennsylvania and the Mahoning Drive-In. Their story seemed to encapsulate the entirety of the lifecycle this unique theatrical venue. First established in 1949, the venue stayed mainstream (meaning first run) as long as they could, but the day came when upgrades to the new digital projection methods and the money simply wasn’t there. Close up, sell off the land and call it a day? 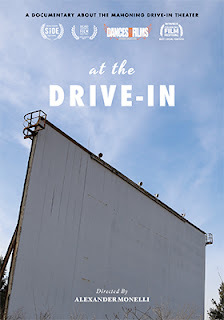 Never, the staff and fans of drive-ins rallied to the Mahoning Drive-In, volunteered their time and turned it into a retro boutique venue (meaning 35mm projection) and carry on. At the Drive-In is their story in particular … and drive-ins in general. Bonus goodies include commentary from filmmaker Alexander Monelli and deleted scenes. Of note, the new season (April through the end of October) for the Mahoning Drive-In begins on Apr. 26 with the double bill presentation of The Wizard of Oz and Willy Wonka and Chocolate Factory. 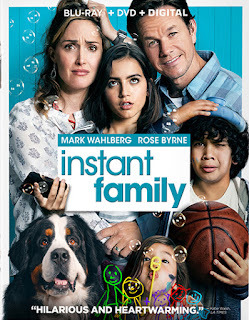 Ever since that bad boy Marky Mark guy of the ‘90s rock group Marky Mark and the Funky Bunch changed his ways and took up acting he has become “money in the bank.” Of course the “Marky Mark” guy is Mark Wahlberg and his latest dramedy hit is writer/director Sean Anders’ Instant Family. Word from Paramount Home Media this past week that Instant Family will be making its way to the home entertainment marketplace on Mar. 5 as both DVD and Blu-ray/DVD Combo Pack product offerings. It arrives home with an ARR of 109 days and ticket sales were a solid $66.7 million. Based on filmmaker Sean Anders (he previously teamed with Wahlberg for the two Daddy’s Home films) own experiences with adoption, Instant Family veers between comedy and drama and in doing so mirrors the tear-in-your-eye ups and heartbreaking downs of taking on the parenting of a teenager … with two younger siblings. Pete (Wahlberg) and his wife Ellie (Rose Byrne — two-time Emmy nominee for her role as Ellen Parsons in Damages, plus such films as Star Wars: Episode II - Attack of the Clones, Troy, Insidious: The Last Key, X-Men: Apocalypse, etc.) seem to have everything. They buy and “flip” homes, Pete’s a whiz at construction … it has, in many ways, become a successful livelihood, but without meaning, because it is just the two of them growing older; there’s no family. Ellie is the first to recognize this and gets Pete to go along with the plan of attending a meet-and-greet session event at a foster care facility. One thing leads to another and in short order Pete and Ellie take an interest in Lizzie (Isabela Moner — Sicario: Day of the Soldado, Transformers: The Last Knight), a troubled teen. 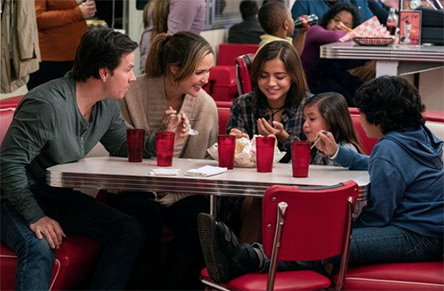 But, and this is a big BUT, social workers Karen (Octavia Spencer) and Sharon (Tig Notaro) inform the pair that the smart-mouth Lizzie has two younger siblings who are also in foster care as a result of their mother being a drug addict. It’s like agreeing to take a kitten home and then being informed that the kitten has a baby sister that no one wants … “can you make a home for that baby too?” How can you say no? Pete and Ellie suddenly have an “instant family” and are very much in the deep end of the pool from the get-go. The film could have been played as an updating of the 1968 comedy classic starring Henry Fonda and Lucille Ball, Yours, Mine and Ours, but instead filmmaker Sean Anders gives us both the good and the bad … all the moments of joy as well as the anger and frustration of a rebellious teenager who seems hell-bent on shredding all of Pete’s and Ellie’s good intentions. 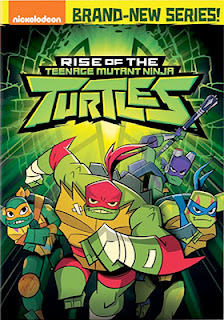 In other release news this week from Paramount Home Media, we find that Nickelodeon’s all-new animated reboot of the Teenage Mutant Ninja Turtles franchise will make its first DVD appearance on Mar. 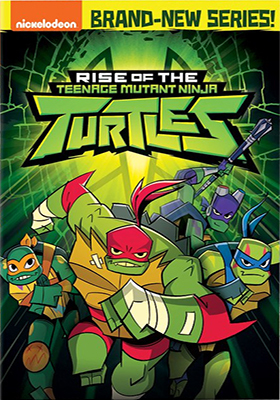 12 with the debut of Rise of the Teenage Mutant Ninja Turtles. Meet Raph, Leo, Donnie and Mikey, the ninjas-in-training in seven thrill-packed episodes that take place under the streets of New York City. The neophyte ninjas discover that Baron Draxum rules the underworld with the help of the Oozesquitos and the creation of mutants is the Baron’s bag. They also have to be on the lookout for the mutated chef by the name of Meat Sweats who is working on a secret recipe to cook the four turtles and in doing so gain their super powers … gulp! One magical night, 32 years in the making … John “Willie” Wilcox, Kasim Sulton and Todd Rundgren, better known to prog rock fans as the members of the ‘70s band, Utopia, reunited for one night at the famed Chicago Theatre on May 22 of this past year. Gil Assayas standing in for Roger Powell on keyboards. Cleopatra Music & Film, with sales and distribution expertise provided by MVD Entertainment Group, has tabbed Friday, Apr. 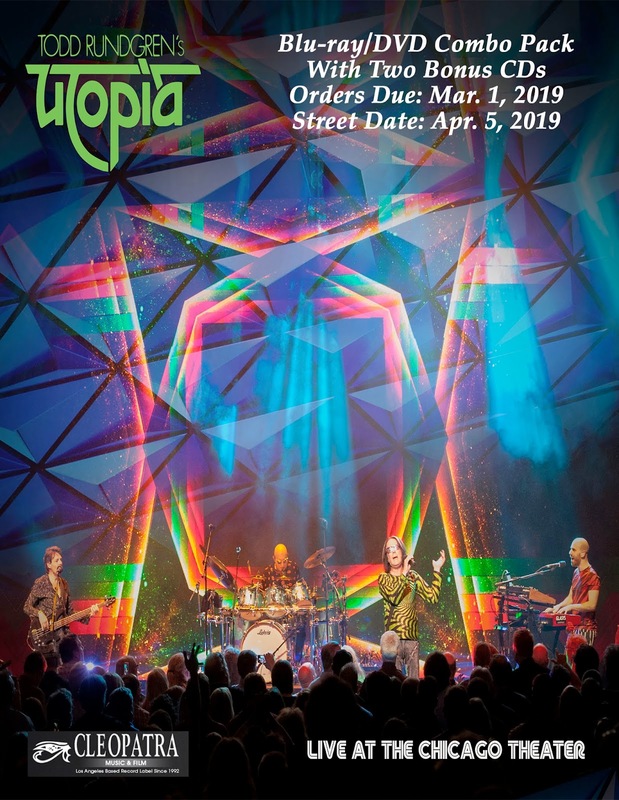 5 for the release of a Blu-ray/DVD Combo Pack presentation of Todd Rundgren's Utopia: Live At Chicago Theatre, which include a double-CD bonus. The massive 24-song set kicks off with the 15 minute show-stopping rendition of “Utopia Theme” and then shifted to “The Ikon” … both from Utopia’s 1974 live album, “Todd Rundgren's Utopia.” Fans would have gone into the night euphoric from just the opening 45 minutes, but Utopia was just getting warmed up. Also counted in the evening’s mix were “Another Life,” “Do Ya,” “Freedom Fighters,” “The Wheel” and more … a dazzling, unforgettable evening!! 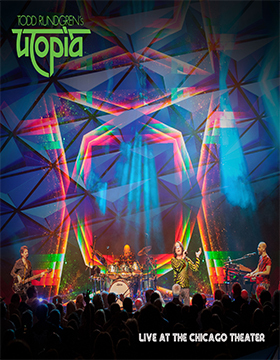 Todd Rundgren's Utopia: Live At Chicago Theatre is a keeper come Apr. 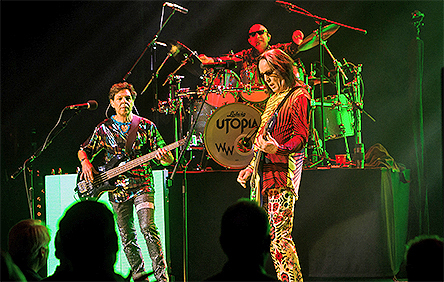 5, which is timed to coincide with Todd Rundgren’s next world tour, which kicks off in Duisburg, Germany at the Theater Am Marientor on Apr. 1. Where is the line? The line that cannot be crossed … where, once crossed, no matter the reasons, there is no redemption! Indican Pictures announced this past week that writer/director Nicholas Holland’s Wronged, a revenge/horror thriller, will be making its DVD debut on Feb. 26. David (Shaun O’Malley — Deceitful) and his wife Andrea (Angela Roberts Johnson — Detroit Unleaded, Patience, a Twisted Love Story) have just experienced something that no parent wants to face, the miscarriage of a child. Although they already have two other children, David has been struggling with personal issues and this is one of those “last straw” sort of things. At the behest of their marriage counselor — who suggests they take some family time away from the normal grind — David and Andrea, along with their two kids, join his father and brother on a camping/hunting trip. It will be peaceful, remote … a place to heal and a time to reflect on what is lost and what still remains. It seems like a perfectly reasonable thing to do. Connect with family, enjoy the outdoors and take a break from the grind of the day, but no sooner do they settle in when a screw-loose savage by the name of John Vicard (Matthew Siman — Moving Parts) and his merry band of sadists descend upon David and his family. Wrong place, wrong time and a man who thinks killing for sport is a nice way to pass the time. For all the world, Vicard and his black-clad warriors look like paint-ball enthusiasts out for a weekend of fun and adventure, but in Wronged things quickly turn to the dark side as Vicard starts to make good on his promise that no one in David and Andrea’s camping party will leave the woods alive! Once that line is crossed and blood is shed there is no turning back for a man already consumed with grief! Wronged quickly becomes an eye-for-an-eye revenge thriller where ultimately there are no “good guys,” only those who survive and those who die. In other release news this past week from Indican Pictures, writer/director Johnny O’Reilly’s multi-story tale of life, love and “other things” in Moscow, which is appropriately titled, Moscow Never Sleeps, will be making its domestic DVD debut on Feb. 12. One thread of the story finds an aging actor by the name of Valery (Yuri Stoyanov) waiting out his final days (a terminal illness) in a Moscow hospital. What a dreary way to die, so he takes it on the lamb, but ends up being kidnapped by a fellow named Arto (Rustam Akhmadeyev) and his cadre of misfits. Famous actor equals money … but he’s dying, talk about a kidnapping not thought completely through. Tangent to this is Valery’s son, Ilya (Oleg Dolin), who is literally obsessed with his former girlfriend, a popular singer, who is now involved with a wheel-dealer businessman by the name of Anton (Alexey Serebryakov) … he must have her back! So stalk her he does. The last thread of this wonderful tale involves a teenage girl by the name of Kcenia (Lubov Aksenova) and her stepsister, Lera (Anastasia Shalonko), who is on a mission to find her biological father … teenage girls on the streets of Moscow, how can that possibly to be a problem? The cloth of the story is stitched together by filmmaker O’Reilly — with the city of Moscow as its star — weaving this way and that, but in the end making connections, sometimes in most unusual ways. Moscow Never Sleeps is presented in Russian with English subtitles. What would can you say about a film that has had weekly screenings — across the globe — since May of 2015? You read that right, continuous screenings for over three-and-a-half years!! That’s unheard of … a feature film, whether a documentary or otherwise, might work the festival circuit for a year; 18 months or perhaps a bit longer, but that’s the limit. 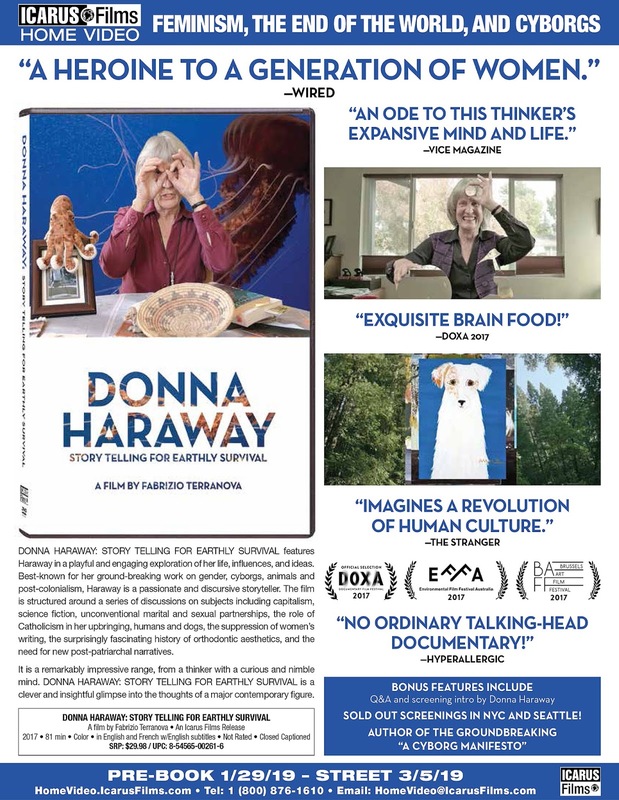 Documentary filmmaker Fabrizio Terranova’s Donna Haraway: Story Telling for Earthly Survival has globetrotted from one venue to the next since it was first screened at the Kunstenfestivaldesarts in Bruxelles in May of 2015. Since Terranova is a Belgium filmmaker that was an appropriate place to the launch the film. In addition to festival screenings, Terranova’s film has worked academic venues, museums, even book stores … anywhere willing to host it and there it was. It has to be some sort of record. In any case, word arrived this past week from Icarus Films that Donna Haraway: Story Telling for Earthly Survival will be available on DVD this coming Mar. 5. An already built-in audience will certainly be lining up for copies to revisit it, while those who have lacked access to a “screening portal” will finally have their chance to see what it is all about. Donna Haraway, professor — Ph.D. in Biology from Yale and Professor Emerita in the History of Consciousness Department and Feminist Studies Department at the University of California, Santa Cruz — is a renown author with books spanning four decades. Included in her works are: “Simians, Cyborgs and Women: The Reinvention of Nature,” “The Companion Species Manifesto: Dogs, People, and Significant Otherness” and “When Species Meet” (among others). Documentary filmmaker Fabrizio Terranova’s gives us an intimate look at Haraway (along with her dog, Cayenne) with sessions that were filmed over several weeks. 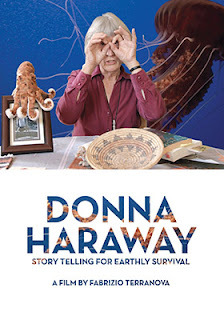 Visually, Donna Haraway: Story Telling for Earthly Survival is nothing like you would expect … the “special effects” are very much in keeping with Haraway’s conversations and insights recorded here. Included as a bonus feature is a Q&A with Donna Haraway in Los Angeles … the documentary itself is in English and French, with English subtitles where appropriate.